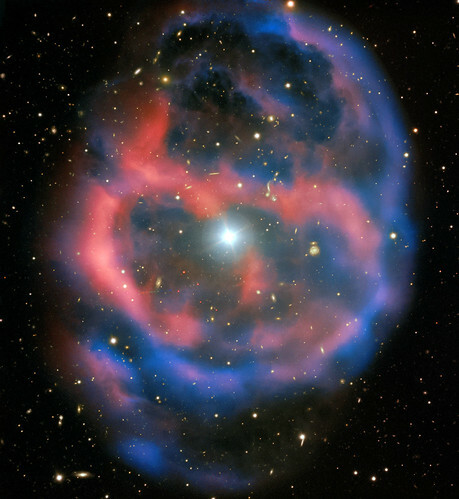 Edited European Southern Observatory image of the planetary nebula ESO 577-24. Color/processing variant. Original caption: The faint, ephemeral glow emanating from the planetary nebula ESO 577-24 persists for only a short time — around 10,000 years, a blink of an eye in astronomical terms. ESO’s Very Large Telescope captured this shell of glowing ionised gas — the last breath of the dying star whose simmering remains are visible at the heart of this image. As the gaseous shell of this planetary nebula expands and grows dimmer, it will slowly disappear from sight. This stunning planetary nebula was imaged by one of the VLT’s most versatile instruments, FORS2. The instrument captured the bright, central star, Abell 36, as well as the surrounding planetary nebula. The red and blue portions of this image correspond to optical emission at red and blue wavelengths, respectively. An object much closer to home is also visible in this image — an asteroid wandering across the field of view has left a faint track below and to the left of the central star. And in the far distance behind the nebula a glittering host of background galaxies can be seen.